Middlesex University Dance academics Chris Bannerman and Anne Donnelly are ‘coming out of retirement’ to perform ‘KnowBody; A Lifetime of experiences’ at the Elixir Festival in September. 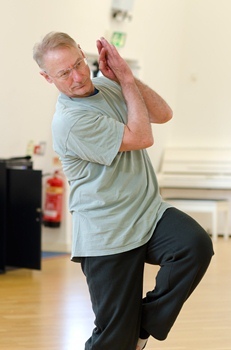 Two Middlesex University Dance academics will return to performing in September, joining a group of extraordinary older dancers coming out of retirement for the Elixir Festival at Sadler's Wells. Director of Dance Programmes Associate Professor Anne Donnelly and Professor Chris Bannerman, Head of ResCen Research Centre, have both been invited to perform. The festival presents a mixed programme of events including performances, workshops and a conference, all of which celebrate the creativity and contribution of older artists. Having worked with one another at the London Contemporary Dance Theatre earlier in their careers, Chris and Anne are now rehearsing for KnowBody alongside former artists of the Royal Ballet, Second Stride and the Siobhan Davies Dance Company. Juxtaposing electronic music and contemporary choreography, KnowBody sees Jonathan Burrows and Matteo Fargion take a break from their renowned duets to "challenge preconceptions and present contemporary dance illuminated by a lifetime of experience". "To actually be in the studio and working is wonderful really. It is a very special and specific environment," says Chris. "Everyone is feeling that love of being in the studio and there is a special feeling among the group, which is perhaps less competitive than among younger dancers who often try to outdo one another." Both Chris and Anne have stayed fit and healthy and naturally spend a lot of time in studios and around dancers but, after focusing their careers on research and teaching, the chance to rehearse and perform again is presenting a welcome challenge. "In many ways it is a surreal experience juxtaposed with the feeling of familiarity, providing the opportunity to allow our physical bodies to engage with their 'trained movement memory'," explains Anne. "None of us are spring lambs anymore, so our physical dialogue with each other, and with the audience, will be different and yet encompass moments and insights of lifelong training. This is an exciting prospect to perform." As the performance develops and rehearsals continue, the work is being documented for research purposes by ResCen on the Elixir blog and Professor Bannerman sees this potentially developing into further writing and research. "It's an example of how higher education and the professional performing arts can work together to develop the arts and knowledge of the arts, and feed both higher educational research and their audiences' thinking," he adds. Elixir Festival runs from Friday 12 to Monday 15 September 2014. There are two performances of KnowBody, on Friday 12 and Saturday 13. For ticket information visit the Sadler's Wells website.